TALLAHASSEE, Fla. — Voters are deciding whether to keep Florida under Republican control with a close Trump ally or elect its first Democratic governor since 1994 — and the first African-American ever — after a campaign marked by a deadly hurricane and gun violence. Gillum’s path to the nomination was a surprise, winning against four better-funded challengers. Hurricane Michael pulled him off the campaign trail in early October when it left nearly all of Florida’s capital without power. He again rushed home Friday, canceling campaign events, after a man shot six people at a yoga studio, killing two before taking his own life. 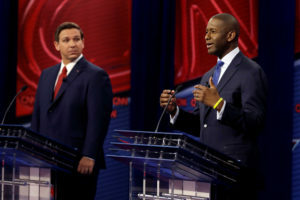 DeSantis won the primary against better-known and better-funded Agriculture Commissioner Adam Putnam based largely on Trump’s endorsement. Trump visited Florida twice in the final six days of the general election to try to boost turnout. Trump’s endorsement of DeSantis is one of the reasons why Anjenys Gonzalez voted for Gillum. The 43-year-old Democrat from Miami-Dade County said protecting people’s civil rights is her most important issue. Tarrio said he worries about Gillum’s proposed corporate tax hike. In Miami Beach, Greg Freeman was among the first in line to cast a ballot for Gillum as the polls opened Tuesday morning. He took a red-eye flight from the West Coast to vote, and cited health care as a major issue because he has a pre-existing condition and has already seen insurance premiums sky-rocket. “I don’t want to be in a high-risk pool,” he said. The election — expected to be close — has the potential to shake up the political landscape in the third largest state in the country.